The geologists we talked with said that some Alaskan glaciers are very dynamic. For example, the glaciers of southeastern Alaska receive large amounts of snowfall each year. These glaciers give rise to a lot of melting, and — if they reach the sea — they might spawn icebergs. 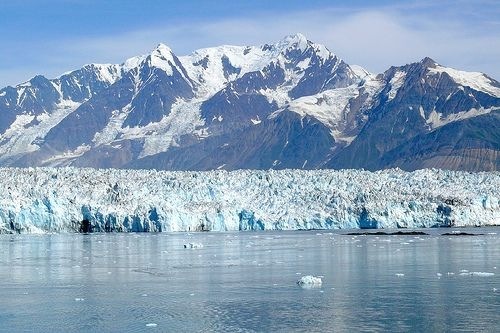 Snow that fell on a glacier in southeastern Alaska a few hundred years ago might have melted already — or it might be calving from the glacier as a new iceberg this year. But ice in different parts of a glacier moves at different speeds. Ice near the surface moves relatively quickly — at around 60 meters, or about 200 feet, each year. The ice near most glaciers’ surfaces may be no more than about 500 to 1,000 years old. On the other hand, ice deeper down in a glacier moves more slowly. Some of the ice near the bottom of a large glacier might be from 5,000 to 20,000 years old. So, in this sense, some Alaskan glaciers are remnants of the ice age. Even the faster Alaskan glaciers can be considered remnants of the ice age — in the same way a river is considered the same feature year to year even though it is completely different water. We don’t re-name the Colorado River when all the water that was in it at one point in time has all flowed out. Sharp, Robert P., 1988. Living Ice: Understanding Glaciers and Glaciation. Cambridge: Cambridge University Press. Elias, Scott A., 1995. The Ice-Age History of Alaskan National Parks. Washington, D.C.: Smithsonian Institution Press. Erickson, Jon, 1996. Glacial Geology: How Ice Shapes the Land. New York: Facts On File, Inc.
Broecker, Wallace S. and George H. Denton. “What drives glacial cycles?” Scientific American (Jan. 90), pp. 49-56. Hamilton, Thomas D., Katherine M. Reed, and Robert M. Thorson, Eds., 1986.Glaciation in Alaska: The Geologic Record. Anchorage: Alaska Geological Society. Krimmel, Robert M. and Mark F. Meier, 1989. “Ice field trip T301: glaciers and glaciology of Alaska.” IN Glacial Geology and Geomorphology of North America (Field trips for the 28th International Geological Congress).